VertaseFLI was appointed by Avant Homes to undertake supplementary site investigation at the former GKN Sports Facility at Newbold Road, Chesterfield and subsequently to carry out enabling works to prepare the site for redevelopment for a residential use. 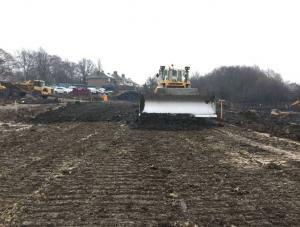 We worked alongside the clients consutant and ensured that earthworks levels were factored in from an early stage to minimise inport and export of waste. Site investigation & interpretation, Modeling of identified coal seams, Site Clearance & Demolition, Extraction of shallow coal seam, Stabilisation of deeper coal seam, Installation of Criblock Wall, Geotechnical re-profiling of site. Review of previous site investigations and additional site investigation to fully delineate the extent of shallow coal and contamination hotspots. Software modelling of: the shallow coal (Cockleshell Seam) running east to west through the centre of the site; and The Lower Tupton seam present beneath the site at c. 14 mbgl in the east corner of the site, dipping to the west, beneath the site. Recovery of the shallow coal seam for sale. Drill and grouting of the worked Lower Tupton coal seam in the east corner of the site – in order to stabilise the seam by substantially filling any voids. Installation of a Criblock Wall retaining structure. Excavation and management of four shallow contaminant hotpots that presented a risk to human health. Substantial re-profiling of the site in order to form a series of development platforms for residential properties and installing the capping layer for the site highway. 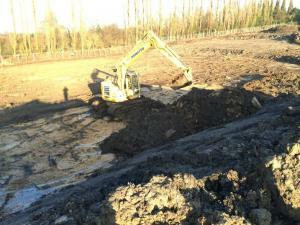 All geotechnical works were carried out in compliance with Series 600 Earthworks and Highways Specification. Highway works were carried out in close liaison with the client, the client’s independent consultant and Derbyshire County Council Highways Department – to satisfy all stakeholders that the road met the required specification for highway adoption. The recovery of the shallow coal and the drilling and grouting of the Lower Tupton seam were carried out under licence issued by the Coal Authority.